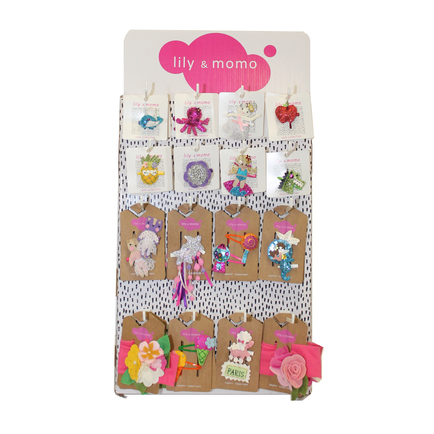 Lily and Momo collection features hair clips, clip keepers and headbands with packaging made from recycled paper. Handmade and with the philosophy of “Happy Together”. These are accessories that girls’ love to wear. This is not your typical hair bow company, they bring a fresh and updated twist to girls’ accessories. Why struggle choosing which Lily & Momo solo clips , Happy Together Clips and Headbandss to add to your display when we can choose for you! For more detailed photos please click on the individual product listing.